As the only commercial and professional gathering in Middle East & North Africa region for CSP and solar thermal domain, CSP Focus MENA 2019 provides the most powerful and effective platform for all industry players. 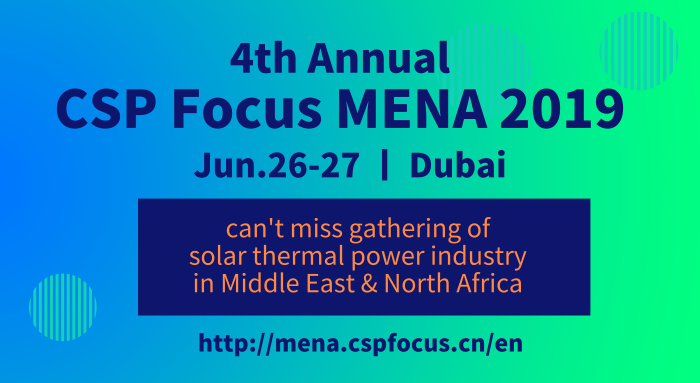 Held during June 26-27 in Dubai, the 4thAnnual CSP Focus MENA 2019 will welcome over 200 CSP and solar thermal thought leaders from MENA and abroad, getting you the professional platform for getting known of MENA CSP future deployments & flagship project updates and excavating more business opportunities & market demands. MENA CSP key players will be invited and joining the event: DEWA, KISR, MASEN, ACWA Power, Shanghai Electric, Abengoa, Bright Source, Cobra, TSK, SEPCO 3, EDF, Empresarios Agrupados, Zhejiang SUPCON Solar, Royal Tech CSP, Thermax…. What to be shared and discussed during CSP Focus MENA Jun.26-27 Dubai?